Like the tail fin of a humpback whale, SCUBAPRO's Twin Jet Fins use a split-hydrofoil shape to deliver more forward motion with less effort. Result: more power with less effort and drag. Patented split-fin propeller technology - proven to deliver more forward motion with considerably less effort than traditional blades. 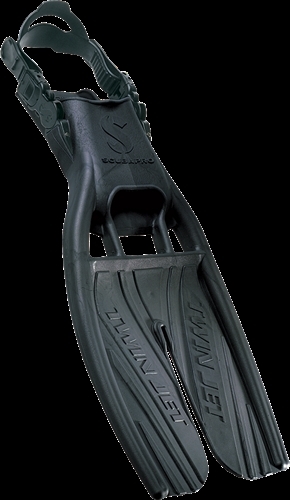 Extra-wide foot pocket is ideal for wearing with a dry or semi-dry suit - also very comfortable to wear with standard warm-water boots.